This is tasty and easy, it is going in my meal rotation. I cooked it in a pan also, didn’t pound, used red onion,, a touch of molasses and regular splenda, olive oil and no scallions. I used the red pepper flakes and the heat level was perfect (I like medium hot) I look forward to making some of your other recipes, I love working with new ingredients and discovering new tastes. Made this last night, yummy. Put it with brown rice in a lettuce wrap. My children told me I can make this again! Which cookbook is this in? To the complaints I read you might want to rethink. 4 oz of raw chicken cooks down to 3 oz which is 2 smart points. The rest of the ingredients spread over 4 servings and cooked off are probably the extra 1 smart point. I can’t wait to try this tonight as Gina’s dishes are consistently great! Could I marinate and then put the chicken w marinade in slow cooker? Hi Gina, First I have to say, I always love your recipes. Skinnytaste is my go-to for tasty recipes. I do want to ask about the points bc even though I see a lot of comments about them , I haven’t seen an answer yet. When I use the WW calculator , I come up with each serving being 4 SP, not 3 SP. Can you please clear this up for me? I’m making this tonight and I’m considering having 2 servings in lettuce wraps. What kind of pan do you use in the video? It looks like a pan and not a grill? O.M.G. 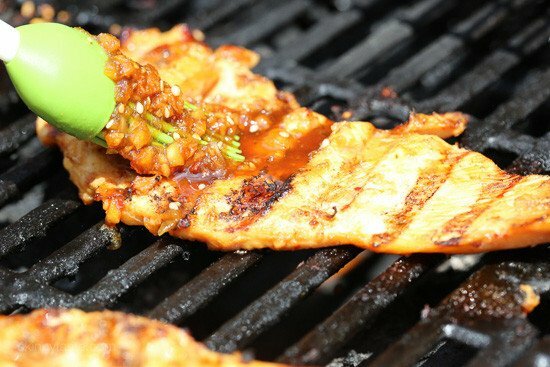 This is the best chicken marinade I’ve ever tasted! I live in WI so I baked the chicken instead of grilling it! I can’t wait to grill it when the weather gets nice! This recipe is a must! I’ve shared it on FB & WW Connect! Great! I love this chicken!! I used this marinade on salmon fillets last night and charred on the BBQ. It was amazing. I will be making this in bulk from now on. My family’s favorite chicken! So easy and flavorful. I have some picky eaters and they can’t get enough of this! Made this tonight. Impressed. So flavorful!! I always struggle with chicken breast dishes…and this was delicious!! Oh my gosh! This is soooo good! It is game changing for my Asian food cravings! Thanks so much for all your wonderful, healthy recipes! It makes a healthy lifestyle so much more exciting! I liked this but didn’t love it. The marinade wasn’t really that special to me. My SO liked it though and it made it a nice thursday night dinner with the pesto baked tomatoes and a nice green salad. New family favorite. Kids and grown ups all loved it. my son is allergic to sesame. Can I omit it? or sub another oil? I made this for dinner and my husband and I really enjoyed it. I wasn’t able to get apple sauce so I tried grating an apple. Next time I’ll try to get apple sauce. I have made many recipes from your site and have never been disappointed. Love em! Fantastic! 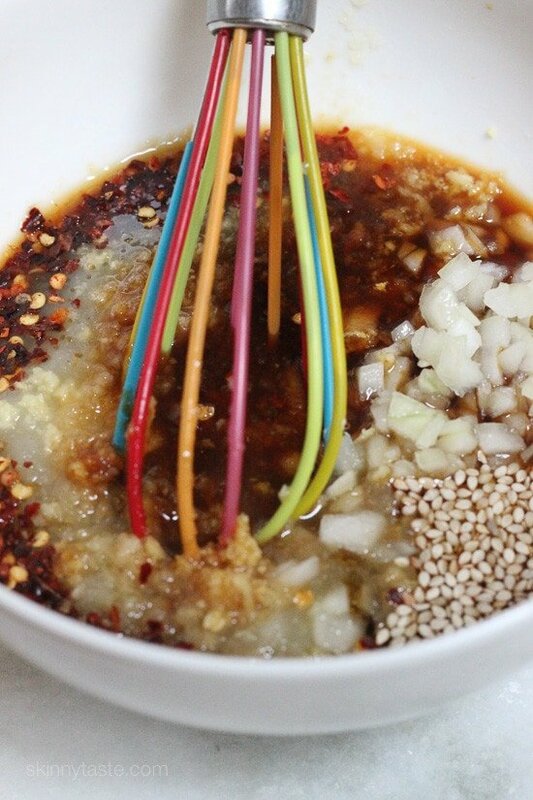 I whizzed the marinade with my stick mixer so it took max 10 min to prepare. I sprinkled on the scallions at serving time. Made extra marinade which I diluted with more apple sauce for serving. Thanks! Garlic messes with my digestive system, will eliminating the garlic totally screw up the recipe? Do you think you could even taste ¼ the garlic? I love garlic but it doesn’t love me! I only used one clove of garlic as I am the same. It was perfect. How long can you marinade the chicken, is over night to much? Really enjoyed this and would make it again. I used an indoor grill and it worked just fine. I have made this three times for guests. Everyone love it! I use a mix of boneless thighs and boneless breasts. I let it marinade for a couple of days ahead of time. Serve with an Asian couscous and big salad, it makes a simple delicious meal! this was delicious! we are approaching the 7th circle of hell in TN so i made it on a griddle pan – LOVE the marinade! i doubled it, so i still have some left! thinking of trying it with pork and beef as well!!! another home run!!! Do we put the green onions on last when the chicken is cooked, or do we add it to the marinade? I cannot eat soy sauce, any substitute suggestions? I made this twice with chicken per the instructions and got rave reviews. I had a pork loin one week that needed to be used up and marinated it in this sauce then grilled it kebab style with tasty results. Such a versatile marinade. Thanks for sharing! I made this last night and it was delicious! So quick and flavorful! This was fantastic! Loved by the whole family. I had no applesauce so added a tablespoon of sweet chili sauce and omitted the chili peppers, tasted great. Don’t forget to oil the grill, I did and the chicken stuck a bit, but still great. This was so delicious. It was amazing how juicy the chicken was and the marinade really gave it an amazing flavor. I make a lot of your recipes, but this one made me go online to comment! Kudos Gina!!! Moderator – is the nutritional info updated by your RD? Saw a reference you were updating it but maybe I kissed the post with the updated counts. Thanks! Great Recipe!! I didnt have any apple sauce so I peeled and blended an apple, I also blended the onion and garlic (sorry I’m lazy! ), Two thumbs up, I am excited to try this on tofu as well! OMG this is SO good! Just so you know, I normally don’t like sweet asian sauces on meat. My bf was coming over for dinner, and I thought he’d like this, so I gave it a shot. WOW! We both couldn’t stop raving about it! Delish! I served it with a miso edamame cucumber salad. YUM! Great! Glad you both enjoyed it! Delicious! I’ve made this for family and also to serve for a dinner with friends. It’s also on the menu for this evening and it’s one of those dishes that gets the entire household excited for dinner. Does anyone know if these Korean grilled chicken breasts freeze well/thaw and reheat well later? Thanks! Made this recipe for dinner tonight and it was amazing. Glad I stumbled upon this website earlier in the week. I left out the ginger and served it over spaghetti squash. Can’t wait to make this again and try other recipes. We tried this a month or so ago and have made it about 5 times since. It is SO good, and not time consuming (always a plus when you have little ones taking your attention). The kids can’t get enough of this, and my husband and I could eat it every night (we aren’t hard to please, but we do love a good Korean recipe!). Thanks so much! I’m so glad to have discovered your website. Thank you for the pictures, and recipes, and reviews!! I’ve already been back 5-6 times. The hype is REAL! After hearing so many rave reviews from the WW community, I had to try this. It’s AWESOME! The hubs loved it, too! I marinated it overnight and cooked it in a skillet. I will be having leftovers for lunch tomorrow and I can’t wait!! I made these for dinner last night and you are not kidding when you say this is the BEST grilled chicken recipe! My biggest complaint with grilled chicken is that it can be so bland sometimes – this was so flavorful! I served it with broccoli/cauliflower slaw but next time I’m going to divide up the marinade and serve it over rice. Thanks for the great recipe! Isn’t it amazing, so glad you enjoyed it! Delicious! Kids liked it too! I made this tonight. It was really easy and was fantastic! I’ve tried about 8 of your recipes and have not be disappointed! I will definitely be making this again. Thanks for all the great recipes! I can’t believe how simple and AMAZING this was! I doubled recipe and followed it to the T. Never again will I be purchasing those nasty bottles sauces. would the points be the same if using skinned, boned, chicken thighs? Thanks. We love this recipe! My 8 year old son is very picky about sauces and marinades, but he gobbled this one up! I’ve made it with both chicken breast and thighs and it is always a winner! Yay! Love when the whole family enjoys! 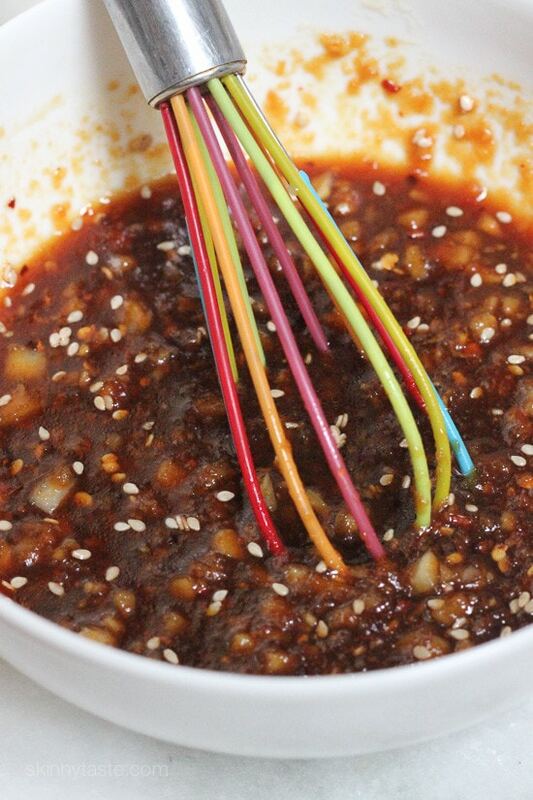 Did you ever think of using Fuji apples grated into the sauce instead of applesauce to sweeten the Korean sauce? I just grated a Fuji Apple into my marinade, as I didn’t have any applesauce on hand. I also didn’t have any sesame oil on hand, nor olive oil, nor canola, I used mayo. I’ll let you know how my daring substitutes worked. ( I didn’t like the color-I pray the taste is good. Okay. All done. Due to time and ingredient constraints, I begin by saying,, I was looking for a flavorful and new recipe for chicken, which, these days, have become, a common ingredient. Your recipe inspired me! I used what I had on hand: chicken breasts, chicken thighs, drumsticks. I cut them all (except the breasts -bone in- cut in half), away from the bone, bone still in. I did not pound. Nor do my hour marinate. I cleaned & cut up my chicken. Cut my onions (both), grated my ginger, tripled my recipe (big family), grated my apple, crushed my garlic, mixed soy sauce, my ingredients. Since I didn’t marinade, I sprinkled my chicken with granulated garlic, onion, ground pepper, a bit of seasoned salt. I poured marinade all over it. It was very wet, I wanted crispy, tender, and juicy, and I was baking it. I put my oven on 475 degrees for 45 minutes, and prayed. It was beautiful! A wonderful golden crispy on top, juicy, and tender beneath. Flavor throughout. Thank you Gina, next time, I’ll have all goods on board. It was great! Color in the end was beautiful. AI jus. 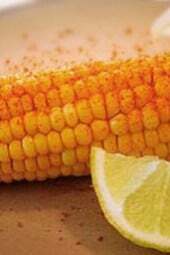 Used it on the rice, and parts of the chicken, served w/ corn on cob. Made the dinner by doubling the recipe. It was wxcellent. I would have liked a little extra sauce to serve on top. Serviced with jasmine rice and an Asian slaw hit. It was easy and delishios!!. Is a keeper. Thank you. Next time try using a little cornstarch for the saved 1/4 cup of marinade to make a sauce with instead of using it directly on the chicken as you cook it. Wow – looks amazing. I love cooking asian food on my grill. Makes a nice change to covering meat in bbq sauce! This recipe gets better and better every time I make it!!! My kids and hubby LOVE it!! I always make with jasmine rice (kids favorite) and a green veggie (tonight was broccoli). I like to use boneless/skinless chicken thighs instead of breasts…just a little juicier. I also slice the chicken in bite size pieces after it cools then mix it in the extra marinade…then we just scoop over our rice. So good!!! Thank you so much for sharing your talent with the world!! I made this tonight. Due to weather I baked it in the oven, the chicken was so tender! Great recipe. Not sure if people are using the new Weight Watchers Smart Points system, but I got exactly what Gina got in terms of Smart Points calculation. 16 oz of raw chicken breasts is 7 points + the marinate (in total 5 points) = 12 points divided by 4 = 3 points per serving. Maybe it is because the measurement of the chicken is 16oz raw, not 16oz cooked chicken. Could that be what is confusing everyone else? I have made this time and again and it is one of my favourite recipes. I decided to make my own applesauce rather than buy a jar and then only use 1/4 cup. I also add a 1/2 tsp of Sambal Oelek instead of pepper flakes as I love the heat. Great dish. Thank you. This is incredible!!! 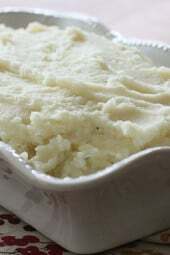 I am addicted to this recipe! Thank you so much. Your recipes look and taste incredible! Could this be frozen in the marinade then prepared later? This is a great recipe. My husband loves it. Thank you! I just found your website as I was looking for healthy chicken recipes. I count my macros, so when i saw you include the nutritional info I was beyond thrilled! this gave me a better idea of if I could make your recipes as well as sides and vegetables I could add to it and still meet my macros. I wrote down your Chicken Fajitas, Chicken Thai stir fry, as well as this recipe. I cannot wait to try these and I just wanted to send you a big thank you. I have book marked this site, for sure! Absolutely delicious! We made this for the first time tonight and I have already added to our family favorites. We are going to try it on pork soon. Thank you for the great recipe. We made this tonight with some jasmine rice with coconut oil and some grilled pineapple on the side. Simply delicious..I don’t think I could have ever survived WW and gotten to goal and maintained without Gina and Skinnytaste. Thank you Gina, for your GREAT RECIPES!!! Making this for the 2nd time. First time was such a huge hit that I have to make it again! The marinade smells so yummy that I could just eat it on it’s own. Super easy recipe! Thanks! I made this 4 days ago and loved it. The marinade could have been on the chicken longer, so here I am making it again with the intention of soaking it overnight and possibly using the pressie cooker tomorrow! Thanks for the yummy recipe! This was seriously amazing! I marinated it overnight though and I am so glad I did. I couldn’t wait to have it the next day for leftovers. I will definitely be making this again, it was way better than any marinade in a jar thats for sure! The nutritional information on this is way off. It is more like if there were 8 servings. Still not bad though. When I put it into MFP I get 214 calories per serving for a 4oz. serving. Could I omit the applesauce & brown sugar and use a bit of raw honey instead? Made it for dinner tonight and loved it. Another great recipe!!! Thank you for your great recipes!!! Made this last night and my family absolutely loved it. I’ve been asked to make it again today! Also i brought some leftovers for lunch in and i have to say, i was surprised at how much tastier it was – flavors were stronger than last night. This is just wonderful. Cooked on the grill. Has anyone tried this without the brown sugar? I'm doing whole 30 and am wondering if it would still be good minus the sugar. I often add a packet of Splenda or other sweetener in place of the brown sugar. Artificial sweeteners are not allowed on Whole 30. I’m going to try it with a couple of pureed dates instead of the sugar. I have a feeling It’s probably sweet enough with just the applesauce and the coconut aminos though. :). I’ll try to let you know how it turns out after I make it!!! #whole30 #yougotthis! Can you reply on the calorie questions? I want to make this, but worried about the calorie count based on some of the other comments. Thanks. This says it makes 4 servings. The calorie count is for only one ounce of chicken plus sauce. Its 100% wrong. 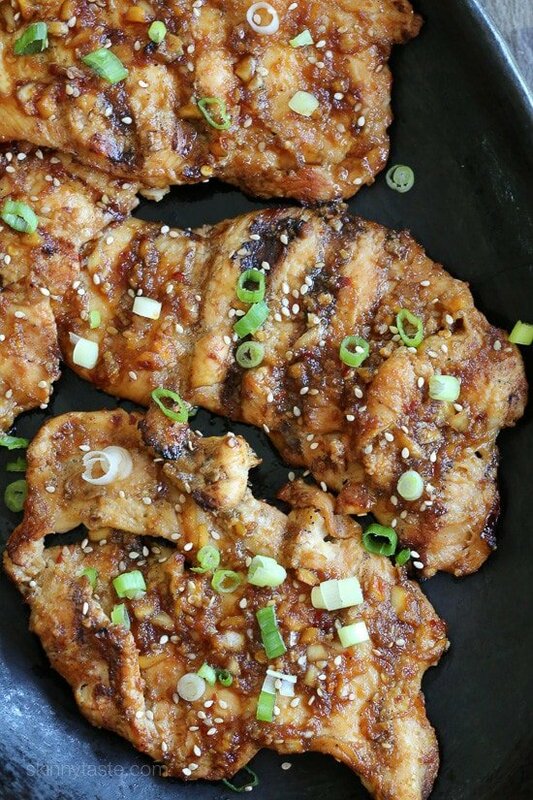 Just the chicken, sesame oil & brown sugar puts you over 2oo calories. Very misleading. Thanks for pointing out the error, however that’s a bit harsh. Mistakes happen, I have already contacted my RD and she is looking into this to see what the error is. I often pound out chicken breast for ease of cooking – I don’t have a mallet either. You can use anything – bottom of a mason jar, bottom of drinking glass, butchers knife handle (VERY CAREFULLY). It makes such a difference for ease of cooking. Sure Perdue would work just as well – I just find that sometimes those type of cuts are slightly more expensive. Good Luck! Made me get chills up my spine…..Sounds dangerous pounding with glass or a knife! How about a small sauce pan or can of veggies or beans! Much safer. I stick the breasts in a gallon freezer bag and pound those babies with the side of my fist. No tools needed. How long do you think the marinade will last in the fridge? If you're having doubts about making this and love Asian elements in food.. definitely try this!! This is now one of my favorite recipes and the marinade is delicious. Can't wait to try on other meat. Just made this for dinner and it was fantastic!!!! Love the marinade. I chose to use beef instead of chicken and it is amazing on my grill pan. I now make this every Sunday night as part of my weekly meal prep. I double the recipe for 2 lbs of meat. One son adds steamed, brown basmati rice and a green veggie, the other just a green veggie and for myself, I toss it in a kale salad. I made this and it was delicious. Instead of red pepper flakes I added sriracha sauce, about 1-2 tsps and it was such a good addition. Hi, do you think you could use this marinade on tofu?? Thanks! I use beef so no reason tofu wouldn't work. Making this tonight, I am so excited. FYI, I put this into the WW recipe builder and it came up as 4 smart points, not 3. Is the apple sauce something I can omit entirely? I have a severe allergy to some fruits (apples, pears, kiwi.. The list goes on unfortunately). Just wondering if it's a key ingredient or if there's something I can sub in. Christine T, I made this for dinner last night. I didn’t have any applesauce on hand as the recipe called for. However, I DID have some sugar free apricot jam! I just used a couple tablespoons of the jam in place of the applesauce as I’m sure the jam was much sweeter in taste, than the applesauce. 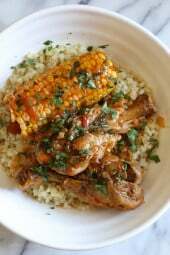 The recipe turned out delicious and the family loved the moist, tender chicken. So, I’d say, use whatever fruit you are able to use in a jam or pureed form. If you’re counting calories or WW SP’s adjust accordingly. But, you have to try this recipe! Good luck! Thank you for the jam tip, Tammy. I will have to try it since I don’t normally have applesauce on hand. How can this be 121 calories when (according to internet) 4 oz. of raw b/s chicken breast is 124 calories by itself? I’m also questioning the WW point count. Because the chicken breasts are cut in half length wise as per the directions. using the WW app, I calculated 121 calories of chicken to = 2.6 oz. A 4 oz serving of boneless, skinless chicken breast is 185 calories. I will have my nutritionist double check it. Made this for dinner tonight, it was very good will definitely be in my rotation, thinking about trying it with shrimp, what do you think? Oh, I use beef now I am definitely trying shrimp. Made this tonight, and it goes onto my list of top 10 favorites. Even my kids ate it right up. My only regret is not doubling the marinade and using 1/2 as a sauce for rice (or in our case tonight, over broccoli). Also, I cooked in a pan on the stove top because we are in the middle of a snow storm and it turned out fine. Additionally, my ginger, garlic and even onions were granulated/dried because I needed to go to the grocery store. But it was still amazing. Really, really tasty. I will definitely be making this again. My husband and children loved it! I cooked it in a skillet and it turned out great. I was able to use the marinate from the pan. Paired it with rice and broccoli. Made the marinate the night before and marinated the chicken about an hour once I got home from work. Easy, quick, delicious meal.